Motorola Astro Saber UHF radio, model number H04RDF9PW7AN. This is a 4 watt, 160 channel radio with a band split of 403-470. Flashcode =500001-000000-8. They will do both analog and APCO P25 operation. The model #: H04SDF9PW7AN. Astro IMBE (P25 Digital). I have tested the radios for TX and RX. The radio is transmitting at 3.5 watts or better. Used Radio. VHF bandsplit 146-178 MHz. Motorola Astro Saber model II (limited keypad). Radio condition: B-. Tested for TX and RX. H35/G48 Conventional Operation. MOTOROLA Astro Saber Model I VHF 146-174 5W 48Ch H04KDC9PW5AN. We will respond promptly to your inquiry. Programming Service For Motorola XTS5000, XTS3000, XTS2500, XTS1500, Astro Saber, PR1500, MT1500 Radios. It's an Astro Digital P25. They work in conventionnal and digital, inwide (25 khz) andnarrow band(12.5 khz). The radios look like new and work very fine.They were bench tested and work perfectly.Very easy to program yourself. MOTOROLA ASTRO SABER MODEL 3 VHF NARROWBAND PORTABLE RADIO. FULL VHF NARROWBAND WITH 32 CHANNELS. ASTRO SABER PUBLIC SAFETY RADIO. 32 CHANNELS - RF BAND VHF 136-174MHZ. DIGITAL P25 & ANALOG! ASTRO P25 DIGITAL OPERATION. This belt clip is used and in good condition. It fits the original Motorola ASTRO Saber radio. It will NOT fit the ORIGINAL Saber series. This remote speaker microphone is Intrinsically Safe with ASTRO and Saber radios. The NMN6217B Motorola speaker mic features 6-foot coiled cable, clear audio, a lapel clip and a heavy-duty strain-relief and is Intrinsically Safe only with Astro Saber. Each bid is for one unit. New Motorola NTN9121A Astro Saber Spectra UCM Encryption Module. Available is a new and sealed in the box Motorola NTN9121A. Photo of the open UCM is for reference only. MOTOROLA ASTRO SABER MODEL 1 800MHz NARROWBAND PORTABLE RADIO. ASTRO SABER PUBLIC SAFETY RADIO. This radio was received in the condition pictured. It is used but in good condition. RADIO ONLY and FREE 32 CHANNEL PROGRAMMING. Frimware - 6.72 (Rebanded). 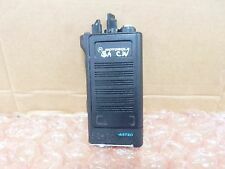 Motorola Astro Saber 800 Mhz radio - model number H04UCF9PW7AN. This is a 3 watt, 160 channel radio with a band split of 806-870 Mhz. Flashcode = 540008-000480-6. They will do both analog and APCO P25 9600 Baud operation. Frimware - 6.72 (Rebanded). 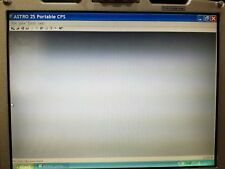 (6) Motorola Astro Saber 800 Mhz radios - model number H04UCF9PW7AN. These are 3 watt, 160 channel radios with a band split of 806-870 Mhz. Flashcode = 540008-000480-6. They will do both analog and APCO P25 9600 Baud operation. 3ALGO Encryption board for Motorola ASTRO Saber or ASTRO Spectra. AES-256 DES-XL DES-OFB. (6) Motorola Astro Saber UHF radios - model number H04RDC9PW5AN. These are 4 watt, 48 channel radios with a band split of 403-470. These units have the 1 mag VOCON board. Free programming is available (1-16). $↵ Voltage - 7.2V Capacity - 1800mAh Chemistry-Ni-CD Dimensions -4.04"x2.93"x1.14" Weight -12.98 oz. It's an Astro Digital P25. They work in conventionnal and digital, inwide (25 khz) andnarrow band(12.5 khz). The radios look like new and work very fine.They were bench tested and work perfectly.Very easy to program by yourself.